You may or may not have realised that I (conveniently for my pen name) love flowers. I'm not into researching and growing them in the same that Hubby B is, but I love to take pictures and enjoy the colours and prettiness of them which is ever changing through the year. My love of the pretty florals, meant that when I was sent this item for the Meet the Maker feature, I couldn't wait to see it up here on my blog. Just look at the pretty antique feel. How apt for spring (now it is finally coming...we hope). So in true Meet the Maker style, lets find out refreshment preferences and get to it! Tea please. Milk, no sugar. That’s a tough one...cake please. I’m Claire, the other half of Rosey Posey Creations, which I run with with my mum, Cathy. I’m from Devon originally but I have lived in London for nearly 5 years. We have just got back from New York!! 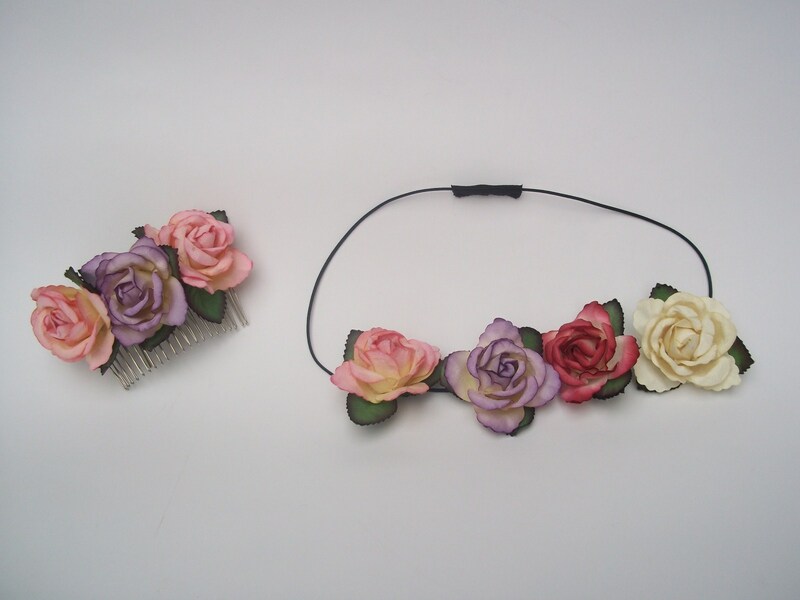 These are our most popular creations- the large hair comb and the thin floral headband. The large comb has three large paper flowers on it and the invisible wire ‘teeth’ disappear when you slide it into your hair. It’s perfect for an up do or when your hair is loose. With the floral headband , we can make the thin elastic band in white and black for lighter or darker hair. You can hide the band in your hair so you just see the beautiful flowers and you can even wrap it round a bun. How long have you been making headwear and how did you learn? My mum has always showed me how to do basic sewing and how to customise clothes etc and there was an element of teaching myself too. I want to learn how to make really elaborate headpieces like fascinators with lots of flowers, lace and pearls. When did you start Rosey Posey Creations and why? Rosey Posey Creations started in January. Just before Christmas my mum and I were shopping and I saw a winter head warmer that I really liked but it was extremely expensive. My mum, Cathy, said ‘I can make that!’ And true to her word, I received a package in the post a couple of days later with a beautiful deep purple headband embellished with a bunch of small purple and white flowers on a bed of lace. I decided to make them for my friends for Christmas presents and got such good feedback that we decided to set up a facebook page. After selling our wares at a couple of craft fayres we decided to set up a website with an online shop and here we are! I take a lot of inspiration from celebrities and singers such as Pixie Lott, Lana Del ray, Paloma Faith and magazines. The catwalk is a great way to find out the latest trends and colours. Spring is a lovely time to bring inspiration in a flower headband, with all the daffodils in bloom and the weather getting warmer. My motivation is the customer’s delight at the end product and the pride of seeing something I have made on their head. I make everything in my living room- my poor flatmates! I have a little corner where I keep everything which is great but I would love an entire room which I could dedicate to it. My mum makes them back at home in Devon, she has completely taken over the dining room! We are now on sale at two shops, Huckleberries Cafe and Gift Shop in Brixham, Devon and Ruby Blu Gift Shop in Southgate, London which is amazing. We have a couple of fayres coming up and our creations are being used in a short film and a promo video. We are very excited about a wedding photoshoot in June in which our creations are being used in conjunction with wedding dress boutique in a railway carriage that has been converted into a beautiful beach front villa in Selby. Yes please do. You can purchase our creations from our website www.roseyposeycreations.co.uk, our facebook page- Rosey Posey Creations and Twitter- @Roseyposeyc. Get in touch! So far- getting a degree I suppose. Thank you for the interview, it’s been fun! Thank YOU Claire. It's been lovely to get to know you and we wish you the best in future ventures :-). Now readers, shall we all go join the virtual world of Rosy Posey Creations?